Come and visit the world's best collection of elk antler. 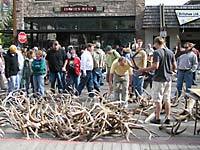 The antler are collected from the National Elk Refuge, then sorted, bundled, weighed, organized into lots and sold at public auction on the town square. This event is what got it all started. Antlers are ready for viewing at 7:00 a.m. Registration begins at 9:00 a.m. and the auction begins at 10:00 a.m. Don't miss it! 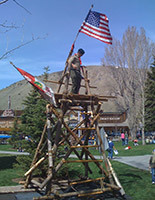 Join the Jackson District Cub Scouts and Boys Scouts on the town square for their annual Boy Scouts of America Expo. Each unit in the Jackson District of the Boy Scouts of America will have an area set up to share their scouting skills and fun activities with the public. Come on over and participate in a craft, game or outdoor skill. Private Antler Sale is adjacent to the Jackson Town Square. Come and see all of the other antlers for sale, as vendors come from all over to display many unique deer, moose, and elk antlers. Jackson Hole Youth Baseball will be hosting breakfast and lunch just south of the BSA Auction. The breakfast menu is coffee and donuts. The lunch menu is hot dogs, chips and drinks. 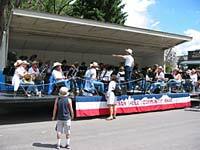 The Jackson Hole Community Band will play selections of music to brighten a spring morning, Familiar and new tunes, marches, and patriotic fare will set the stage for the auction. Under the direction of their new conductor, Jennifer Levanduski, the band will provide an exciting warm-up to the annual Elk Antler Auction. 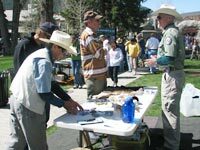 The Jackson Hole Historical Society and Museum's booth will feature Tom Lucas demonstrating bighorn sheep bow making and flint knapping. 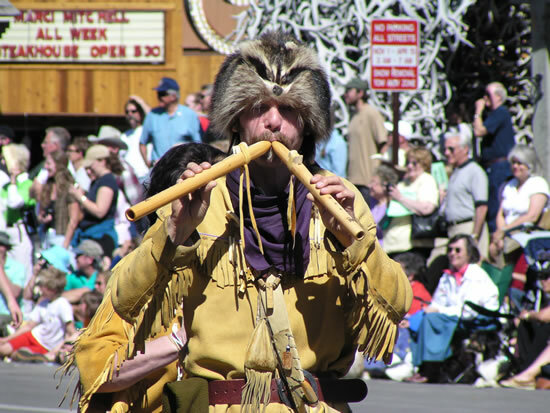 Books about Jackson Hole history will be on sale. Learn about the Museum's new exhibits, the research center, and upcoming programs and events. Visit our booth to receive complimentary tickets to the Museum. 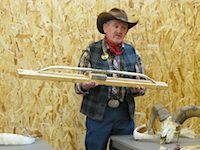 The National Elk Refuge and Wyoming Game & Fish Department offer an array of hands-on activities for kids of all ages. 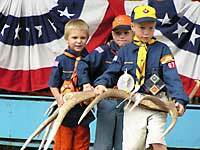 Wyoming Game and Fish Department will be hosting displays for children and adults alike. Kids can come take our animal ID quiz and learn about mammals in the area. Adults can find facts about how they can start antler hunting themselves. There will also be information on bear safety, wildlife diseases, and fishing and hunting regulations. Stop by our booth in the town square and say hello to the redshirts. What is a National Wildlife Refuge? What kinds of birds might I see while visiting the National Elk Refuge?  What is the difference between an antler and a horn? The National Elk Refuge Elk Mascot will also be joining us for a fun-filled day of activities. 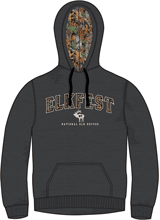 Get your exclusive Elkfest t-shirt, hoodie, and ball cap early. They go quickly! Here is the design for the 2018 T-shirt. Here is the design for the 2018 Hat. Here is the design for the 2018 Hoodie. 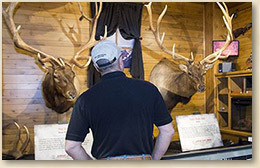 The Great Elk Tour is the Rocky Mountain Elk Foundation's premier traveling conservation exhibit. Showcasing mounts of some of the largest bull elk in the world, the Great Elk Tour is a must see for hunters and wildlife enthusiasts. This year's all new line-up of six monster bulls come from coast to coast. Included this year are these beautiful bulls, Herd Bull, Washington Discovery, Drop Tine, Back from the Brink, Father-Son Hunt of a Lifetime, and Protecting the Heard. 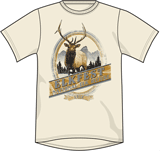 Click here to visit the Great Elk Tour website. A Great Time For A Great Cause! Every RMEF chapter has its own special night once a year -- the annual BIG GAME BANQUET, where fun and fundraising combine for a memorable evening. Sumptuous meals, laughter and a high-energy auction form the backdrop for a night when new friends are made and old acquaintances renew their friendships -- all in a special spirit of camaraderie shared among folks who love wildlife. These events provide the majority of funds used for RMEF wildlife conservation projects. Again this year, the Rocky Mountain Elk Foundation Big Game Banquet Annual Fundraising Dinner will be held at the Heritage Arena, at the Teton County Fairgrounds, 305 W. Snow King Ave, Jackson, Saturday, May 19th, 2018. The doors open at 5:00 PM. Enjoy drawings, raffles, games and the silent auction. Dinner and live auction will follow. Come taste the Best of the West in chili. Local and regional contestants cook up a tasty variety of chili. $5 will buy you a spoon. Are you a great chili cook? 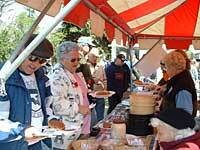 Come and show us, join the Jackson Hole High Noon Chili Cook-Off. The Howdy Pardners Association would like to invite you to participate in the annual High Noon Chili Cook-Off. We are looking for professional chefs to represent their restaurants, individuals who have a killer chili recipe, and groups representing their businesses or non-profit organizations. Make your chili any way you want. RED or GREEN! MEAT, BEANS, or VEGETARIAN ...YOUR CHOICE! It doesn't matter we are just looking for the best in Jackson Hole! There will be no entry fee to participate. But you will need to provide at least 8 gallons of Chili for tasting by the public. Deadline for entry this year is Friday, May 11th, 2018.